The King has disappeared with his entire retinue! Help the Queen find her beloved by journeying across fantastic worlds. Settlers in trouble? Farm stopped bearing fruit? Puppies asking for too much food? Tribes suffering from an invasion of trolls? 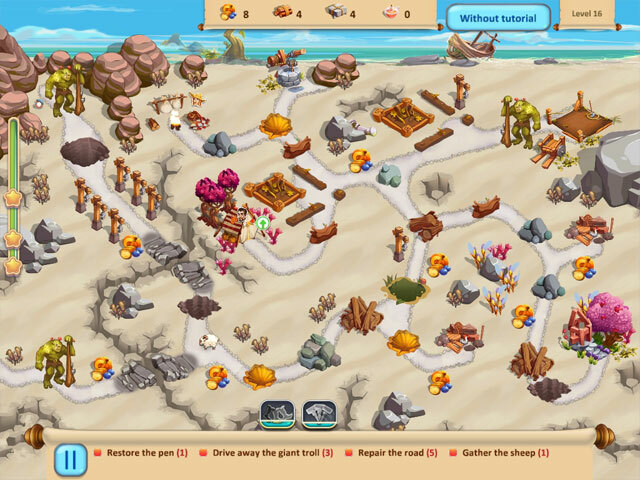 Play Caesar and use careful resource management skills to help everyone! Simple controls and a helpful tutorial will allow you to easily grasp the game’s basics. If you get in a tough spot, don’t forget about the Queen’s mighty magic! 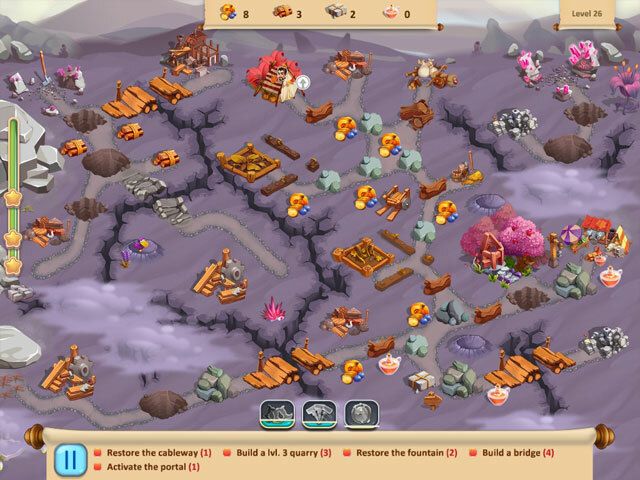 Do you have what it takes to save the King and return prosperity to the kingdom? 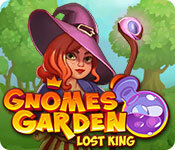 Gnomes Garden: Lost King is rated 2.4 out of 5 by 5. Rated 4 out of 5 by Lizm44 from Seems OK to me I'm not sure what the other players are talking about when they say objects are small and clicking on the eggs does nothing. I play on a mac computer with a 21 inch screen and I can see everything fine. I imagine if you're playing on something smaller, objects will appear small and difficult to see. Clicking on the eggs does nothing, you're right, you have to click on the chicken. This is explained in level 4 when you click on the chicken, the game says it helps you complete the level on time. I like to play with no limits or challenge so I can't speak to the level of difficulty. I just like to play and veg out. I have all the other Gnomes Garden games and like them as well as this new one. Rated 3 out of 5 by MYSQ4 from Not Too Bad But Not Great This isn't the worse game you'll ever play and it can have quite a challenge at times. There are several levels I've had to start over several times before I worked out which order to do things. The first few levels I think had terrible graphics, as it looked like a childish painting; but the further on I went, it began to look more like I would expect it. I have run into some bugs, but finally had to call it quits on level 39. There is a "mound" on this level that my little guy started hammering and never stopped. Rated 2 out of 5 by skippett from Not much fun This game is very much like the prior games in this series, but I was hoping for a bit more of a challenge. Everything is pretty predictable until level 39 when the game comes to a screeching halt because there is a mound right after the games starts that is supposed to be pounded away, but the poor little fella just pounds and pounds, but nothing happens. Rated 2 out of 5 by rudy1959 from Nothing Different Here I don't see anything new here. Put your glasses on for this because everything is SO tiny, you can't see anything . Run around, pick stuff up (if you can see it) and then do it again. I agree that these magic eggs are dumb and do nothing when you click on them. This game looks like a bunch of grade schoolers put it together in a computer class. Not for me! Rated 1 out of 5 by pennmom36 from WELL NOW WHAT? I always play the Standard Edition version so I can find out what differences there are between the Collector's Edition and Standard Edition versions. I wasn't all that surprised when I still saw that the Hidden Animal Eggs were still visible, because sometimes that's the case in a TM game, and I did try to click on them in the first and second level but nothing happened. 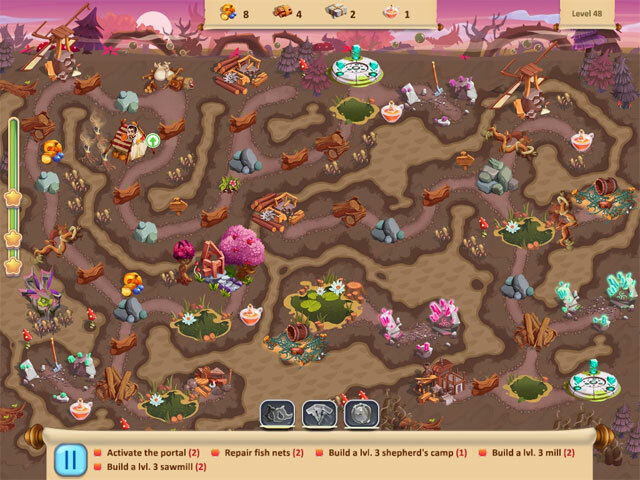 I didn't think it was an issue until I reached the third level and as part of the tutorial it pointed to the egg and I couldn't proceed because I couldn't collect the egg animal no matter where I clicked and so I exited out and reinstalled the game. Again, I couldn't collect the egg on any of the first 3 levels. Now I suppose I could just disable the Tutorial to solve the issue of getting past that point, but if the animals are a vital part of the SE version (the magical animals help you finish the levels on time) what good will it do? I'll give them the benefit of doubt that perhaps it's an issue with my computer, even though highly doubtful, at least you'll know that this could be an issue, so please try the demo first! Here's a recap of my CE review to show you the differences between versions with the exception of the Magical Animals that I have no clue about at this point: I was a huge fan of the first three Gnomes Garden Time Management games, but now they are just repeats stuck in the past. I'm not surprised because this dev is famous for rehashing the same games over and over, the only thing they ever change is the title. Same features, same graphics, same music, same options, same layouts, and now they are trying to push CE & SE versions on us without giving us CE extras! In the first edition of Gnomes Garden, the Gnome Princess was tasked with restoring the Royal Garden to help cure the King's illness. In Gnomes Garden 2, the evil Troll Queen kidnapped the Princess, and after she was rescued she and the Troll Queen became friends. In the third episode, a Warlock took over the Monarch's Castle and he too was eventually defeated. In the fourth episode (not including Halloween & Christmas editions) the castle was restored to its former glory, but the lands surrounding the kingdom were desolate so the Princess embarked on another journey to the land of the Elves to obtain the Green Recipe from the Queen to breathe life into the unfertile lands. In this fifth edition, the King, and his men have vanished, and a search party has been sent out to retrace their steps and hopefully rescue the King and his Royal Crew! All the usual TM tasks are available, and nothing new has been brought to the table. You can play in an Easy, untimed mode or Classic mode, and earn up to 3 stars per level. The graphics are very basic and very "old school" and although you will have to address tasks in a somewhat logical manner, there isn't a whole lot of strategy involved, so the level goals are certainly 3 stars obtainable, and more than likely on the first attempt. You will gather various resources like food, wood, potions, stone etc, and build or repair bridges, sawmills, workers huts, laboratories, food mills, sorcerer's huts, prospector huts, beehives, Sheep/Donkey houses, cableways, and quarries. Each level after the tutorial has basically the same level goals which become repetitive. Each level has a Hidden Animal (which looks like an egg with horns?) and I'm assuming this is a CE bling feature? Not sure of this as an SE feature or a glitch? The CE version has 31 Trophy Achievements to earn, 5 Music Soundtracks and 10 Concept Art pictures, which in my opinion, hardly qualify as Collector's Edition bling, at a CE price. There are no extra levels (49 total) and no Strategy Guide. GNOMES GARDEN SERIES LIST Title***Standard Edition Release Date***Average Rating 1-Gnomes Garden 1 SE only (August 18-2015) 3.9 2-Gnomes Garden 2 SE only (December 30-2015) 3.6 3-Gnomes Garden 3 SE only (May 30-2016) 3.4 4-Gnomes Garden: New Home SE only (March 15-2017) 4.1 5-Gnomes Garden: Halloween SE only (October 23-2017) 3.3 6-Gnomes Garden: Christmas Story SE only (December 23-2017) 4.3 7-Gnomes Garden: Lost King SE (November 14-2018) n/a by: 8 Floor Games LTD.